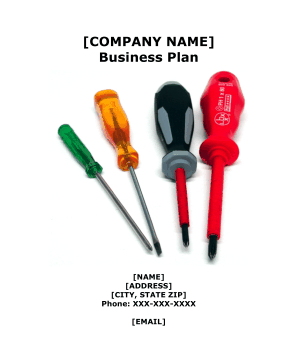 This is a free, printable business plan outlining the necessary services, organization and market strategies for hardware store owners and those working in the retail sector. [COMPANY NAME] will be a sole proprietorship owned by [NAME]. The Company is a start-up as [NAME] will purchase the rights to the existing location for $75,000. Upon purchase of the rights, the Company will demolish the existing structure and build a new State of the Art hardware store. [COMPANY NAME] will be a standard general hardware store that offers the parts, material, and advice to tackle any home repair, as well as lawn care. The primary focus will be to satisfy the seasonal needs of the area's customers. The Company will service the hardware and repair needs of the [COUNTY], [COUNTY], [COUNTY] and [COUNTY] County households. The Company would like to increase sales in all market segments above with a concentration of growth in sales to homeowners who do their own repairs. The focus of this business plan is to put forth objectives to launch operations, work efficiently and effectively, and expand internal operations giving the Company the opportunity to grow with sales growth in the surrounding County areas. [COMPANY NAME] is ready to elevate to the next step. The Company is seeking grant funding in the amount of $600,000. The grant funding will be used to launch operations including purchasing the existing land & business, construction of a new Building and purchasing equipment and displays for the store. Additionally, the Company will purchase the opening inventory, develop a website and launch an advertising campaign. 1. Obtain Grant funding to purchase an existing hardware store and rebuild the retail space. 2. Customer Service - Give our customers the highest quality product and service at a fair competitive price. 3. To create a safe environment for people in the community to come for their hardware store needs. 4. To provide jobs within the community. 5. To successfully manage a hardware store. The mission of [COMPANY NAME] is to offer quality hardware products in a customer-friendly shopping environment. Our customers will get assistance quickly and will leave the store prepared to get the job done right the first time. [COMPANY NAME] will also focus on anticipating the seasonal needs of its customers and providing the best products at competitive prices. 1. Location: [COMPANY NAME] will be assuming ownership of an existing hardware store. The Company plans to demolish the existing building and build a new State of the Art hardware store. We will have an existing base of customers. 2. Seasonal Products: Each season has it own unique demand on a homeowner. [COMPANY NAME] will focus on this pattern and bring in local customers by marketing these items at competitive prices. 3. Repair/Project Resource Area: The first section customers will find when they enter is a repair/project resource area that they can use to plan repairs or projects. There will be a repair/project resource person to answer questions and direct them to the section of store where the needed products are. 4. In-Store Expertise: Store employees will be knowledgeable in home repairs/projects. In addition, the repair/project resource area will be used to conduct short trainings and demonstrations in home repair and home projects.